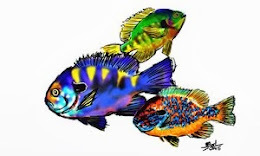 Now, first of all, I am going to tell you that I'm not an expert in any means in "outsmarting" fish. But, I have found a few fishy tricks that I thought would be helpful to some of you. You never know everything. In some way or another, we are all learning something on the water each time we go out. That is a given. And that is why we fly fish. Because it is not always the same scenario each time we go out. Water levels fluctuate, currents change, hatches change, etc. etc.... And so the adventure continues. So, how do we "outsmart" those trout that lie beneath the riffles and pools of our stream? When there isn't a hatch going on and you can visually see the risers in front of you, we look for places that hold trout. This is where reading the water is a necessity. 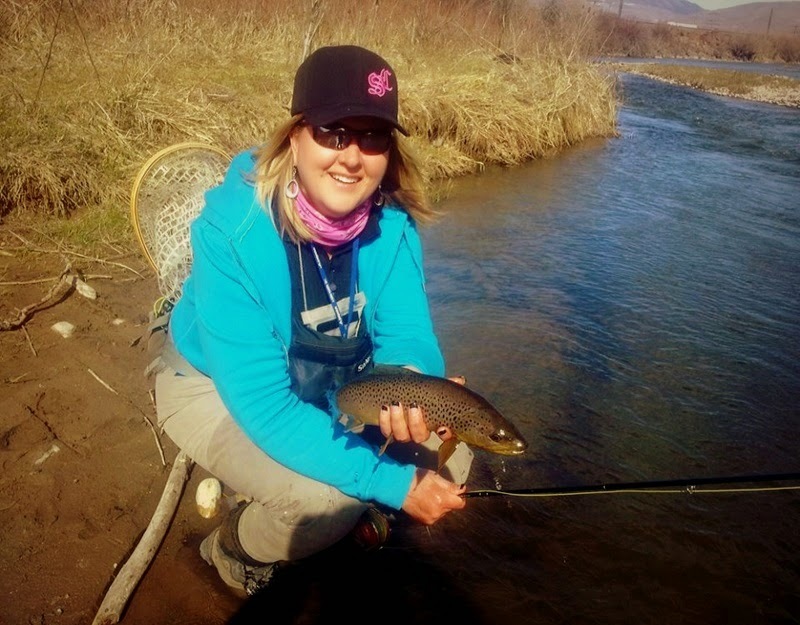 When I first started fly fishing, I was so confused on what to look for and where to find it. Ten years later, I'm not an expert... but, I do know where they lie a lot of the time. I just need to perfect that bug selection and set that hook a bit quicker!! 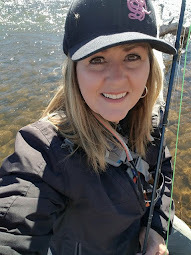 (I have lost a few... haha) When fishing a river, I look for where the fast water meets the slow water. Where the deep water meets the shallow water. And where the rocks offer a resting place for the trout from the fast current. Let me tell you about a fun experience that I had. I saw a tree and a lot of obstruction falling across the narrow channel on the side of the main river. Boy, did I want to investigate! The short riffle on top going into a deeper small pool in front of a fallen branch. For sure, there would be a fish in there! Mainly because, he would think that no one would bother him and be in this safe haven. This was a highly hazardous place for a fly to go astray and not come back. Do you get my drift? Drift... yes, that is what I needed to do. Carefully, drift that fly across that deep spot and then pull the line up quickly before it got caught on the fallen branch. Can you see a "tangled line" happening??? And I might only have one chance if it was a spooky fish. I'm definitely getting more daring. What the heck, I reached into my fly box and picked two flies that I was ok in losing. (Positive thinking, huh?) My placement of the flies would have to be perfect. I could so easily be snagged. I had about three to four feet of water to drift. I casted... I drifted right over... BOOM!!! Hello, Mr. Trout!!! Up and out of the water he came and then down under that stinkin' branch. I have lost too many fish lately due to pulling the line. So, I waited and kept the line tight. A minute later and he went towards the corner of the trunk of the tree. Now, I could start stripping the line in a bit. I worked him a few minutes and he was in the net! Lucky? Yeah, that I didn't lose my flies. But, not lucky that he was there. It was just the perfect place for a fish nap. A huge grin appeared on my face as I released him back into the slow current of the river. I "outsmarted" a fish and it felt soooooo good. I cannot lie. We will all have this experience sometime and will relish in what we have learned in our many journeys out to the water. It makes it so worth it. = ) Go with your instincts. You will probably be right!! 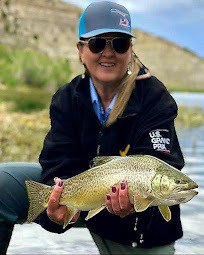 Sunday Tippet: Trout fishing is challenging. But if we find places that fish can feel secure, don't be afraid to try it! Even if there is a bit of obstruction. They will try to find a comfortable place where the current is slowed and food is pushed their way, as this channel was. Trees, undercut banks, rocks (I know, bring a few extra flies) are usually great places to find Mr. Trout. 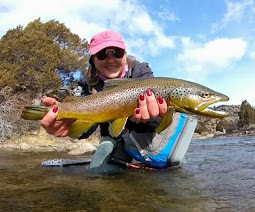 Pulling fish out of those tricky spots really gets me excited! Agreed! It makes the drive home a lot easier... Ha! It all comes down to giving Mr. Trout what he wants that day. The key is knowing what "that" is. That is a real nice pool by that tree. Mark - In this case, he was happy as a clam by that tree. And just waiting for lunch to be delivered. Thanks for stopping by! Still catching hogs I see. Kevin - I can't help myself... If they are there, I must try to reel them in... =) Hope you are doing well.